How can Habits of Mind and Reading Apprenticeship (RA) mutually support one another to help students deepen their confidence, engagement, and fluency with academic texts? This was the inquiry question that recently brought educators together on September 22nd at Hartnell College in Salinas. 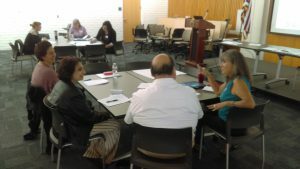 In a 1-day workshop called “Making the Invisible Visible,” participants wanted to build upon an ongoing campus-wide conversation with Habits of Mind– intelligent behaviors and thinking dispositions that research has shown have the powerful potential to promote college and career success– and use what they had learned take a begin a conversation about reading within the context of the RA framework. Before practicing such RA routines as Think Aloud and Capture Your Reading Process, participants watched a video of student testimonials about their experiences and attitudes about reading. 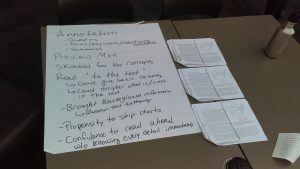 A theme that participants noticed during the debrief was just how much fear and shame students often harbor for reading, presenting a major barrier to learning. Facilitators and other RA veterans in the audience noted that creating and maintaining safe, encouraging environments is a key tenant of the RA framework that can help mitigate feelings of shame while encouraging inquiry-based, meta-cogntive practices inside the classroom and all across campus.